You want your wedding to be like the masterpieces of Van Gogh, Monet and Picasso: unique, thought-provoking, breath-taking. So for the past few weeks, you’ve been picking your brain for ideas to make your dream wedding come true. But so far, instead of the artwork you’ve imagined, you’ve only come up with a few worthless doodles. You need an event stylist. What exactly is an event stylist? 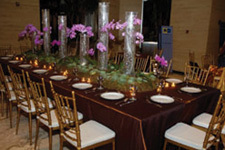 An event stylist is the person in charge of creating the whole ambience of an event. They are in charge of setting the mood, executing the concept and ensuring that the goals you created for your big day are met. According to Henry Pascual, one of the country’s premier wedding stylists, the main goal of an event stylist is to “mimic or create an atmosphere based on the client’s theme or concept. It includes decors, lighting effect, color, proportion of venue to concept, special effects, music to set the mood, etc.” To put it simply, an event stylist is in charge of bringing the jumbled-up ideas you have for your wedding to life. If for example, you wanted to recreate the marriage of Cleopatra to Anthony for your own special day (it’s your wedding, who’s to stop you, right? ), then it’s the event stylist’s job to ensure that that’s exactly what you get. From how your Egyptian concept can be executed to the design of the miniature pyramids to be used as center pieces for the tables, the event stylist is responsible for all of these. Lest you misunderstood, an event stylist is not the same as a wedding coordinator or a party planner. As Mr. Pascual explains, “a wedding planner gathers suppliers and coordinates their services to please the client” while an event stylist “is concerned about the overall ambience of the venue, its theme and fitting the services of other supplies that match the theme, as well as the taste/ preference of the client. And while you might think “event styling” is just a more glamorous and elegant term for “party planning”, it is not. A party planner’s main concern is to give you the biggest and most memorable bash. An event stylist, while ensuring that your celebration will be the best it can be, also offers a more personal end-product. Mr. Pascual for example, bases the concepts he creates for his clients’ weddings on the information he gathers about their beliefs, lifestyle and personalities when he interviews them personally. The services of an event stylist do not come inexpensive. Mr. Pascual is the first to admit that most of his clients belong to the more affluent economic class of society (his roster of clients include Unilab, Shangri-la Plaza Mall and ABS-CBN top honcho Gabby Lopez.) Still, hiring an event stylist does bring a lot of benefits for you and your wedding. First, event stylists are professionals with extensive creative and technical backgrounds. And aside from knowing what supplies are available in the market, professional event stylists also have an extensive network of sources that can provide them with the elements that are critical to completing the look you want for your wedding.